How are things in your world today? Perhaps it’s meh. Whatever. Or maybe it’s utterly fantabulous! Completely awesome and amazing. Great! Some days are better than others. I’ve been thinking though. On many of our days, it feels like something is missing. I think I know what it is: Connection. It’s what binds us to one another. These days it seems like we’re really all slipping away from one another at break-neck speed. Sure there’s Facebook and Twitter and email and never ending texting. It’s as if we’re continually close. But in terms of relationships? So far away. You know what I miss? Real talking. Seeing face to face. Human touch, a real hug, not a cute sound byte followed by LOL! Relationships that only time together forges. It’s like we’ve become shy towards those we already know. We’ve become distant from those in our own families. We’re available by screen connection only. We’re all very very busy. We long for more, but can’t seem to find our way back to a real relationship. Picking up the phone to actually talk feels…well, heavy. As a very young little girl, I was aware art contained underlying messages that painters and photographers were trying to say. In my teen years, it expanded of course to music as well. Andrew Wyeth’s famous painting Christina’s World is the first painting I remembered seeing, knowing that I would always remember this. I was probably six or so and remember seeing it on a restaurant wall. Other people were just eating and seemingly unaware at a table underneath it. But I stopped and really saw it for the first time. It felt like this: I know. And that was before all this technology of the 21st century! We all feel like this sometimes. Outside. Looking in. Unable to go another step. Needing rest and finding none. Alone. Abandoned. Seeking shelter. Almost there, but not quite. So close, so faraway. Maybe that’s just my take, but I doubt it. Everyone seems to know this painting and not even know why they know it. They just do. I saw this painting again the other day after not having seen it for many years. Immediately, I remembered the first time seeing it as a little girl. Decades of experiences and memories have happened to me in the forty some years since I first saw it. 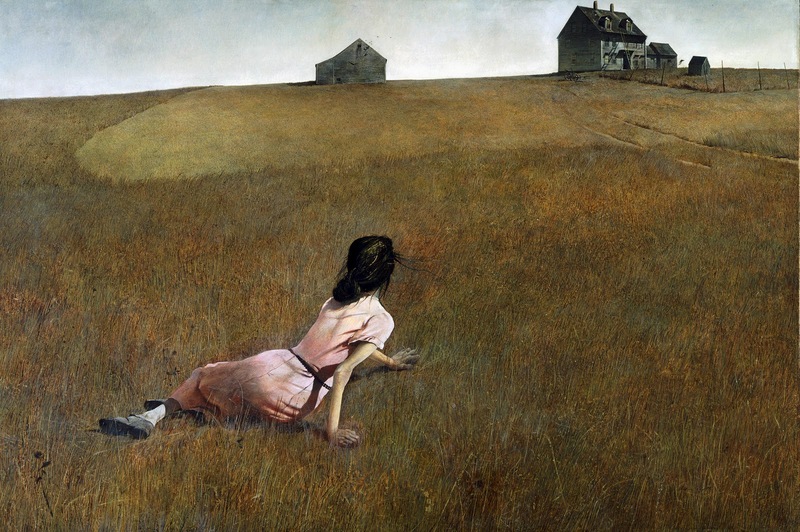 And yet here Christina sits–forever frozen in time, in a field of grass, just shy of the buildings she sees. What is she thinking? What was she hoping for? Christina brings color and light to a plain, even dreary world. She also brings pain and pondering. She brings both beauty and sadness. She brings all of herself and we can almost imagine how she feels, yet we don’t even see her face. It’s like thinking you know someone, and yet knowing really you don’t know them at all. You may not know this, but maybe you are “Christina” in someone else’s dark world. Despite your flaws and your dirty dress, just you being in their picture of the world brings light and hope. Like Christina, you too were created because it pleased our Creator. Art and music are strange magic for sure. Sometimes it makes us look at or hear the artist and we feel as if we know them. Art and music holds up a mirror to our own life with images and words that allow us see ourselves as we truly are, or perhaps wish we were. But it can play tricks on us too. Sometimes we feel sure we are seeing it the way they intended us to see it or hear it the way we think they mean. We think we know them or what they were feeling when they created something, but how can we possibly? Maybe it’s just me. But Christina represents human connection. The painting is so powerful because it appears as if she has none. And yet many feel connected to her, a woman who never really has existed except in the mind of the artist. Or does (did) she? Art and music binds us through beauty and meaning, even though each of us see and hear that which is created, as well as the creator who made it differently. This mutual admiration of that which delights our soul keeps us close, though in proximity we are all far away from one another. And in a world of instant information and messaging, but to the exclusion of real relationships, Christina reminds us there is a world outside of thumbs and screens. She’s a silent reminder to stop, stay, and appreciate art, to see beauty, to find the melody that is the rhythm of our soul: to find and connect to those deeper places in each of us and in the world. At least it does me. I hope I’m not alone.